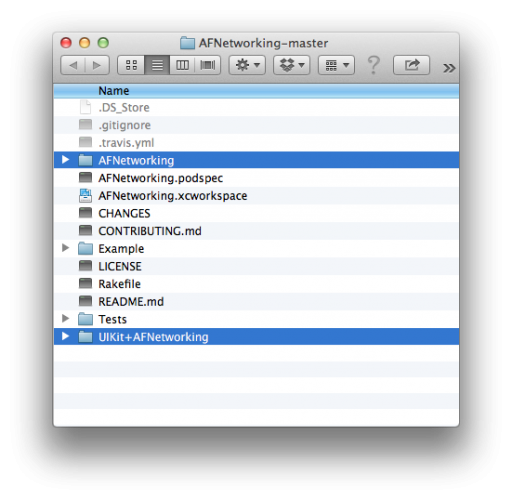 Learn how to easily get and post data from a web service in iOS in this AFNetworking 2.0 tutorial. Update 1/18/2014: Fully updated for iOS 7 and AFNetworking 2.0 (original post by Scott Sherwood, update by Joshua Greene). In iOS 7, Apple introduced NSURLSession as the new, preferred method of networking (as opposed to the older NSURLConnection API). Using this raw NSURLSession API is definitely a valid way to write your networking code – we even have a tutorial on that. However, there’s an alternative to consider – using the popular third party networking library AFNetworking. The latest version of AFNetworking (2.0) is now built on top of NSURLSession, so you get all of the great features provided there. But you also get a lot of extra cool features – like serialization, reachability support, UIKit integration (such as a handy category on asynchronously loading images in a UIImageView), and more. 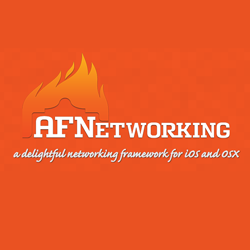 AFNetworking is incredibly popular – it won our Reader’s Choice 2012 Best iOS Library Award. It’s also one of the most widely used, open-source projects with over 10,000 stars, 2,600 forks, and 160 contributors on Github. In this AFNetworking 2.0 tutorial, you will learn about the major components of AFNetworking by building a Weather App that uses feeds from World Weather Online. You’ll start with static weather data, but by the end of the tutorial, the app will be fully connected to live weather feeds. 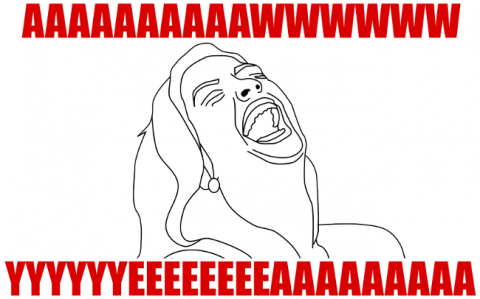 Today’s forecast: a cool developer learns all about AFNetworking and gets inspired to use it in his/her apps. Let’s get busy! First download the starter project for this AFNetworking 2.0 tutorial here. This project provides a basic UI to get you started – no AFNetworking code has been added yet. Build and run the project. You’ll see the UI appear, but nothing works yet. That’s because the app needs to get its data from the network, but this code hasn’t been added yet. This is what you will be doing in this tutorial! The first thing you need to do is include the AFNetworking framework in your project. Download the latest version from GitHub by clicking on the Download Zip link. Drag these folders into your Xcode project. When presented with options for adding the folders, make sure that Copy items into destination group’s folder (if needed) and Create groups for any added folders are both checked. Adding AFNetworking to the pre-compiled header means that the framework will be automatically included in all the project’s source files. Pretty easy, eh? Now you’re ready to “weather” the code! AFNetworking is smart enough to load and process structured data over the network, as well as plain old HTTP requests. In particular, it supports JSON, XML and Property Lists (plists). You could download some JSON and then run it through a parser (like the built-in NSJSONSerialization) yourself, but why bother? AFNetworking can do it all! First you need the base URL of the test script. Add this to the top of WTTableViewController.m, just underneath all the #import lines. This is the URL to an incredibly simple “web service” that I created for you for this tutorial. If you’re curious what it looks like, you can download the source. Note: If you’d like to learn more about JSON, check out our Working with JSON Tutorial. UIAlertView *alertView = [[UIAlertView alloc] initWithTitle:@"Error Retrieving Weather"
Awesome, this is your first AFNetworking code! Since this is all new, I’ll explain it one section at a time. You first create a string representing the full url from the base URL string. This is then used to create an NSURL object, which is used to make an NSURLRequest. AFHTTPRequestOperation is an all-in-one class for handling HTTP transfers across the network. You tell it that the response should be read as JSON by setting the responseSerializer property to the default JSON serializer. AFNetworking will then take care of parsing the JSON for you. The success block runs when (surprise!) the request succeeds. The JSON serializer parses the received data and returns a dictionary in the responseObject variable, which is stored in the weather property. The failure block runs if something goes wrong – such as if networking isn’t available. If this happens, you simply display an alert with the error message. You must explicitly tell the operation to “start” (or else nothing will happen). As you can see, AFNetworking is extremely simple to use. In just a few lines of code, you were able to create a networking operation that both downloads and parses its response. The table view will have two sections: the first to display the current weather and the second to display the upcoming weather. “Wait a minute!”, you might be thinking. What is this [self.weather upcomingWeather]? If self.weather is a plain old NSDictionary, how does it know what “upcomingWeather” is? These categories add some handy methods that make it a little easier to access the data elements. You want to focus on the networking part and not on navigating NSDictionary keys, right? Note: FYI, an alternative way to make working with JSON results a bit easier than looking up keys in dictionaries or creating special categories like this is to use a third party library like JSONModel. // You will add code here later to customize the cell, but it's good for now. Like the tableView:numberOfRowsInSection: method, the handy NSDictionary categories are used to easily access the data. The current day’s weather is a dictionary, and the upcoming days are stored in an array. A dictionary with a single key called “data” that contains another dictionary. That dictionary has a single key called “current_condition” that contains an array. That array contains a dictionary with several keys and values, like cloudcover=16 and humidity=59. Notice that this code is almost identical to the JSON version, except for changing the responseSerializer to the default AFPropertyListResponseSerializer to let AFNetworking know that you’re going to be parsing a plist. 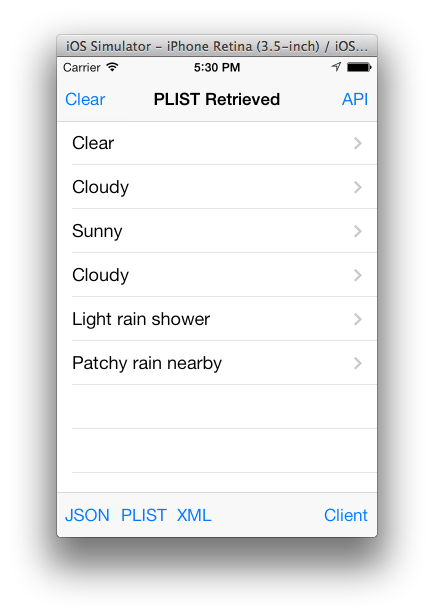 That’s pretty neat: your app can accept either JSON or plist formats with just a tiny change to the code! The Clear button in the top navigation bar will clear the title and table view data so you can reset everything to make sure the requests are going through. While AFNetworking handles JSON and plist parsing for you, working with XML is a little more complicated. This time, it’s your job to construct the weather dictionary from the XML feed. Fortunately, iOS provides some help via the NSXMLParser class (which is a SAX parser, if you want to read up on it). This should look pretty familiar by now. The biggest change is that in the success block you don’t get a nice, preprocessed NSDictionary object passed to you. Instead, responseObject is an instance of NSXMLParser, which you will use to do the heavy lifting in parsing the XML. You’ll need to implement a set of delegate methods for NXMLParser to be able to parse the XML. Notice that XMLParser’s delegate is set to self, so you will need to add NSXMLParser’s delegate methods to WTTableViewController to handle the parsing. This means the class will implement the NSXMLParserDelegate protocol. You will implement these methods soon, but first you need to add a few properties. These properties will come in handy when you’re parsing the XML. The parser calls this method when it first starts parsing. When this happens, you set self.xmlWeather to a new dictionary, which will hold hold the XML data. The parser calls this method when it finds a new element start tag. When this happens, you keep track of the new element’s name as self.elementName and then set self.currentDictionary to a new dictionary if the element name represents the start of a new weather forecast. You also reset outstring as a new mutable string in preparation for new XML to be received related to the element. As the name suggests, the parser calls this method when it finds new characters on an XML element. You append the new characters to outstring, so they can be processed once the XML tag is closed. The current_condition element indicates you have the weather for the current day. You add this directly to the xmlWeather dictionary. The weather element means you have the weather for a subsequent day. While there is only one current day, there may be several subsequent days, so you add this weather information to an array. The value tag only appears inside other tags, so it’s safe to skip over it. 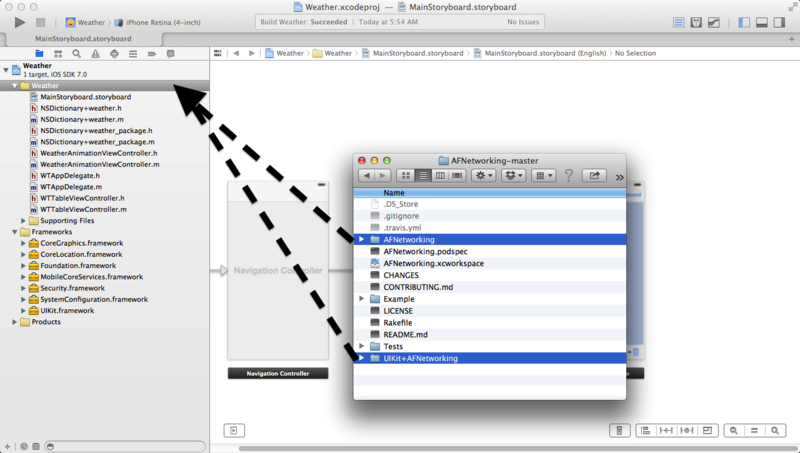 The weatherDesc and weatherIconUrl element values need to be boxed inside an array before they can be stored. This way, they will match how the JSON and plist versions of the data are structured exactly. All other elements can be stored as is. The parser calls this method when it reaches the end of the document. At this point, the xmlWeather dictionary that you’ve been building is complete, so the table view can be reloaded. Wrapping xmlWeather inside another NSDictionary might seem redundant, but this ensures the format matches up exactly with the JSON and plist versions. This way, all three data formats can be displayed with the same code! Hmm, that looks dreary, like a week’s worth of rainy days. How could you jazz up the weather information in your table view? 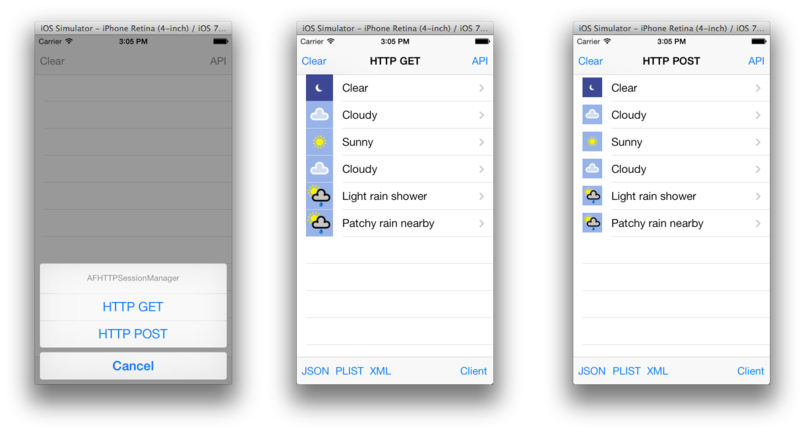 Take another peak at the JSON format from before, and you will see that there are image URLs for each weather item. 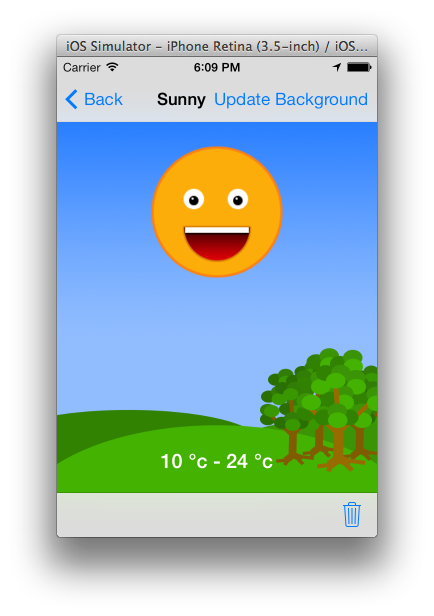 Displaying these weather images in each table view cell would add some visual interest to the app. UIImageView+AFNetworking makes setImageWithURLRequest: and several other related methods available to you. Both the success and failure blocks are optional, but if you do provide a success block, you must explicitly set the image property on the image view (or else it won’t be set). If you don’t provide a success block, the image will automatically be set for you. When the cell is first created, its image view will display the placeholder image until the real image has finished downloading. Nice! Asynchronously loading images has never been easier. So far you’ve been creating one-off networking operations using AFHTTPRequestOperation. Alternatively, AFHTTPRequestOperationManager and AFHTTPSessionManager are designed to help you easily interact with a single, web-service endpoint. Both of these allow you to set a base URL and then make several requests to the same endpoint. Both can also monitor for changes in connectivity, encode parameters, handle multipart form requests, enqueue batch operations, and help you perform the full suite of RESTful verbs (GET, POST, PUT, and DELETE). “Which one should I use?”, you might ask. If you’re targeting iOS 7 and above, use AFHTTPSessionManager, as internally it creates and uses NSURLSession and related objects. If you’re targeting iOS 6 and above, use AFHTTPRequestOperationManager, which has similar functionality to AFHTTPSessionManager, yet it uses NSURLConnection internally instead of NSURLSession (which isn’t available in iOS 6). Otherwise, these classes are very similar in functionality. In your weather app project, you’ll be using AFHTTPSessionManager to perform both a GET and PUT operation. Note: Unclear on what all this talk is about REST, GET, and POST? Check out this explanation of the subject – What is REST? UIActionSheet *actionSheet = [[UIActionSheet alloc] initWithTitle:@"AFHTTPSessionManager"
You first set up the baseURL and the dictionary of parameters. You then create an instance of AFHTTPSessionManager and set its responseSerializer to the default JSON serializer, similar to the previous JSON example. If the user presses the button index for HTTP GET, you call the GET method on the manager, passing in the parameters and usual pair of success and failure blocks. You do the same with the POST version. In this example you’re requesting JSON responses, but you can easily request either of the other two formats as discussed previously. At this point, you know the basics of using AFHTTPSessionManager, but there’s an even better way to use it that will result in cleaner code, which you’ll learn about next. Before you can use the live service, you’ll first need to register for a free account on World Weather Online. Don’t worry – it’s quick and easy to do! After you’ve registered, you should receive a confirmation email at the address you provided, which will have a link to confirm your email address (required). You then need to request a free API key via the My Account page. Go ahead and leave the page open with your API key as you’ll need it soon. So far you’ve been creating AFHTTPRequestOperation and AFHTTPSessionManager directly from the table view controller as you needed them. More often than not, your networking requests will be associated with a single web service or API. AFHTTPSessionManager has everything you need to talk to a web API. It will decouple your networking communications code from the rest of your code, and make your networking communications code reusable throughout your project. Create a subclass for each web service. For example, if you’re writing a social network aggregator, you might want one subclass for Twitter, one for Facebook, another for Instragram and so on. In each AFHTTPSessionManager subclass, create a class method that returns a shared singleton instance. This saves resources and eliminates the need to allocate and spin up new objects. Your project currently doesn’t have a subclass of AFHTTPSessionManager; it just creates one directly. Let’s fix that. 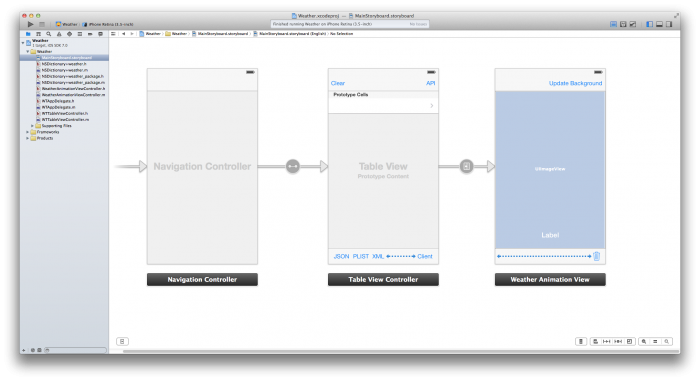 To begin, create a new file in your project of type iOS\Cocoa Touch\Objective-C Class. 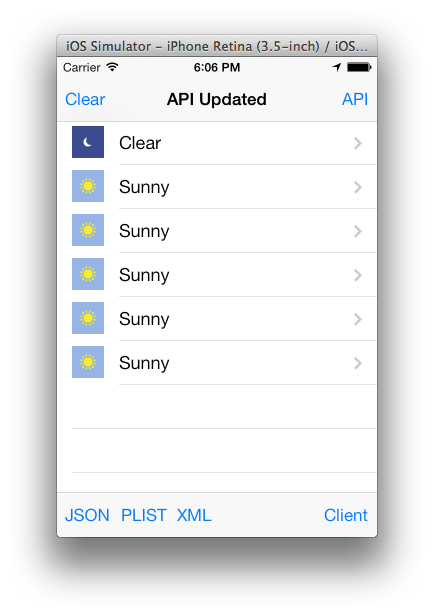 Call it WeatherHTTPClient and make it a subclass of AFHTTPSessionManager. You want the class to do three things: perform HTTP requests, call back to a delegate when the new weather data is available, and use the user’s physical location to get accurate weather. Make sure you replace @”PASTE YOUR KEY HERE” with your actual World Weather Online API Key. The sharedWeatherHTTPClient method uses Grand Central Dispatch to ensure the shared singleton object is only allocated once. You initialize the object with a base URL and set it up to request and expect JSON responses from the web service. This method calls out to World Weather Online to get the weather for a particular location. Once the object has loaded the weather data, it needs some way to communicate that data back to whoever’s interested. Thanks to the WeatherHTTPClientDelegate protocol and its delegate methods, the success and failure blocks in the above code can notify a controller that the weather has been updated for a given location. That way, the controller can update what it is displaying. Now it’s time to put the final pieces together! The WeatherHTTPClient is expecting a location and has a defined delegate protocol, so you need to update the WTTableViewController class to take advantage of this. Now when there’s an update to the user’s whereabouts, you can call the singleton WeatherHTTPClient instance to request the weather for the current location. When the WeatherHTTPClient succeeds, you update the weather data and reload the table view. In case of a network error, you display an error message. Here’s hoping your upcoming weather is as sunny as mine! You might have noticed that this external web service can take some time before it returns with data. It’s important to provide your users with feedback when doing network operations so they know the app hasn’t stalled or crashed. Luckily, AFNetworking comes with an easy way to provide this feedback: AFNetworkActivityIndicatorManager. Enabling the sharedManager automatically displays the network activity indicator whenever a new operation is underway. You won’t need to manage it separately for every request you make. Now there’s a sign of life for your user even when your app is waiting on a slow web service. If you tap on a table view cell, the app takes you to a detail view of the weather and an animation illustrating the corresponding weather conditions. That’s nice, but at the moment the animation has a very plain background. What better way to update the background than… over the network! Here’s the final AFNetworking trick for this tutorial: AFHTTPRequestOperation can also handle image requests by setting its responseSerializer to an instance of AFImageResponseSerializer. This method initiates and handles downloading the new background. On completion, it returns the full image requested. In WeatherAnimationViewController.m, you will see two helper methods, imageWithFilename: and saveImage:withFilename:, which will let you store and load any image you download. updateBackgroundImage: calls these helper methods to save the downloaded images to disk. This method deletes the downloaded background image so that you can download it again when testing the application. You can download the completed project from here. 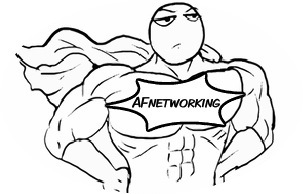 The power of AFNetworking is yours to deploy! If you have any questions about anything you’ve seen here, please pay a visit to the forums to get some assistance. I’d also love to read your comments!